Found this sign while cleaning the shop today. 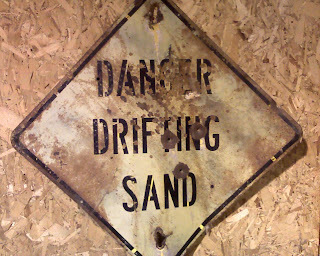 These signs used to be common in this area until farming and irrigation practices changed about thirty-five years ago. *Accidentally uploaded this picture to Shozu without rotating it. Then, when I realized my mistake and tried to fix it, discovered that the file had somehow become corrupted after the upload so I couldn't edit it or transfer it to my PC. The picture is hosted on the shozu server but I cannot figure out how to access my own pictures on Shozu so in the end I had to copy the photo from my own blog in order to edit it and repost it. Left the original since it was already there. Irrigation changed from furrow to sprinkler. Sprinklers require less ground work than furrow irrigation. That, combined with greater soil conservation efforts, resulted in less tilling which in turn means less wind erosion. good soil is precious stuff, eh?